while we are merely in it. since they were only whey. is harmful or is kind? and who would have the gall? from roamin’ in the snow? this still your house or not? Okay, get warm, get cozy, eat. it gathers and transmits this way. you can try them on. (the more I have to guess). drew quick tears from me. came to tend to me. drying tears with his own face. I am captain of my ship. Can it hide from itself just for fun? Does it know it all, stem to stern? Or, like us, does it learn to learn? This entry was posted in Poems on January 1, 2014 by wayaclan. 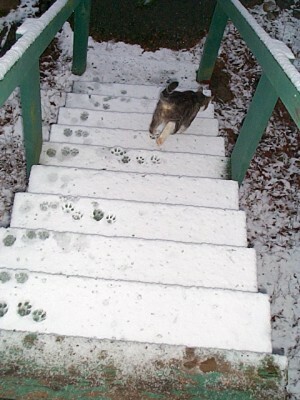 Poems are lovely, as usual, but a special shout-out to the snowy footprints picture! I like it!